On December 20, the world was shocked of U.S. President Donald Trump announcing the withdrawal of U.S. troops from Syria. One of the first reactions from the Iranian regime was delight. Yet this sudden burst of joy was very short-lived as it gave way to concern, along with fear. Without any delay, reports were heard about the U.S. withdrawing from Syria paving the path for a series of very important developments across the globe. The mullahs’ regime are certain of the fact that one of the most important issues on the table for Trump is the Iran dossier. Especially after White House National Security Advisor John Bolton unveiled Washington’s objective by saying the U.S. administration’s goal is to increase so much pressure on Tehran to break this regime’s bones. “As the British say, squeeze them until the pips squeak….We are also going to significantly increase the enforcement of sanctions,” Bolton said in Singapore back in November. This explains why following an initial delight, a wave of concern and fear has engulfed the Iranian regime. Yet what has made the status quo far more dangerous and complex for the Iranian regime are two other developments in this regard. A U.S. aircraft carrier entering the Persian Gulf for the first time after Trump pulled out of the Iran nuclear deal (and ending the longest absence of a U.S. aircraft carrier in this region from 9/11 to this day). The position adopted by Pompeo on Trump’s decision to pull American forces out of Syria. The Middle East remains the source of terrorism; we consider the Iranian regime as the leading state sponsor of terrorism across the globe and this region. The U.S. administration has launched a campaign to increase pressure on the Islamic republic to end this support for terrorism, he said. Of course, the issue of Trump’s decision to withdraw U.S. forces out of Syria remains a complicated matter with many questions remaining unanswered. What is certain, however, is the Iranian regime’s concerns. This illustrates how this decision brings no change in the ongoing trend of increasing of pressures. Not see in the media was the reaction from Iran as reality continues to sink in for the regime and the road ahead looks even more troubling, in their own words. The international and regional isolation against Iran is once again becoming a concern for the regime. Global condemnations over a recent attack on Iraq-based Kurdish dissident groups and the executions of three Kurdish political prisoners resulted in a variety of rebukes concerning Tehran’s warmongering policies in the Middle East and their terrorism in the West. As a result, the clerical regime is becoming weaker on the international stage like never before. Important now is how to evolve and raise the level to benefit the Iranian people. Last Monday, US Vice President Mike Pence condemned Iran’s missile attack in Iraqi Kurdistan. One day later, US State Department spokesperson Heather Nauert added to this condemnation by describing the Iranian regime as a disrupting element in the region and a bad actor across the globe. On that note, Iran’s malign influence in Syria came under fire in the United Nations Security Council on Tuesday as members warned of a humanitarian catastrophe in Idlib, the last area where Syrian opposition forces and millions of displaced civilians are located. France, the Netherlands, Kuwait and Turkey called for a complete halt to military attacks by the Iran-backed Bashar Assad regime and Russia. US Ambassador Nikki Haley upped the tone against Russia, Iran and Assad, accusing these parties of not showing any interesting in reaching a political solution. Iran’s role in Assad’s bloody attacks will not go unnoticed, she warned. The Iranian opposition National Council of Resistance of Iran (NCRI) shed new light on the regime’s terror apparatus. At a press conference held in London on Wednesday, the NCRI provided new details over Tehran’s terrorist activities in the Green Continent, calling on European countries to close the Iranian regime’s embassies, as they are being used by Tehran as nests for their spies, and expel Iranian regime operatives from their soil. Members of the British Houses of Lords and Commons took part in this press conference, emphasizing on the necessity to have Iran’s Vienna-based diplomat and other elements, arrested for their role in plotting to bomb the June 30th Iranian opposition convention in Paris, face justice. One MP presented a plan to the British Parliament condemning Iran’s terrorist activities in Europe. The Arab League also pitched in by condemning the Iranian regime’s meddling in regional countries. 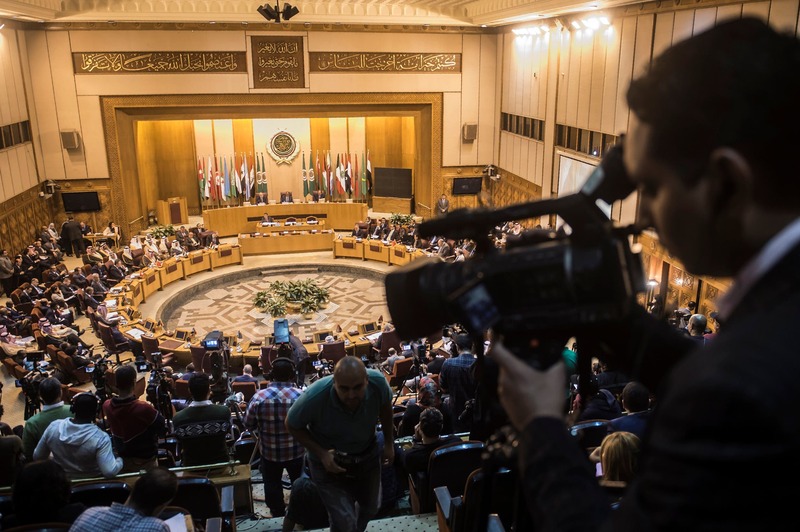 The 150th Arab League session ended this week with the Foreign Ministers Committee issuing a statement expressing grave concerns over Tehran’s provoking religions sectarianism in the Middle East. The statement also condemned the Iranian regime’s support for Yemen’s Houthi militias and their launching of ballistic missiles into Saudi Arabia. After enjoying eight years of unbridled appeasement from the United States under the Obama administration, eyebrows began raising in Tehran again after Washington held this regime responsible for any attack by its proxies in Iraq against U.S. interests. The Trump White House issued a statement warning it will “respond swiftly and decisively” to any such attacks that render injury to Americans or damage to US facilities. The statement by the White House press secretary raised bold accusations against Iran of not preventing recent attacks targeting the US Consulate in Basra and the American Embassy compound in Baghdad. “Iran did not act to stop these attacks by its proxies in Iraq, which it has supported with funding, training, and weapons,” the statement reads. “The United States will hold the regime in Tehran accountable for any attack that results in injury to our personnel or damage to United States Government facilities. America will respond swiftly and decisively in defense of American lives,” the statement adds. On Thursday, French Foreign Minister Jean-Yves Le Drian went a step further by emphasizing on Iraq’s sovereignty, and expressing grave concerns about Tehran’s missile program development and the transfer of these weapons across the region. To add insult to injury and despite the Iranian regime’s claims of being able to confront US sanctions, the regime’s OPEC envoy is heard complaining over how Saudi Arabia and Russia are increasing their oil production. This will eventually balance the oil market and make up for the loss of Iranian oil following the November 4 sanctions Washington has in schedule for Tehran. More insulting is how Russia is treating the Iranian regime even after Tehran’s rulers literally sold-out the Caspian Sea to Moscow. The status quo is quite telling about the Iranian regime’s isolation and impasse in the Middle East, and across the globe. This, coupled with nationwide protests and a social unrest inside Iran, provides a very expressive canvas of Tehran’s current balance of power. Recent remarks by Hossein Alaei, former Revolutionary Guards chief of staff, refers to the Iranian regime’s challenging times. “Today’s political and economic circumstances in Iran are inappropriate… the people are angry and the state must make important decisions,” he explained. It goes without saying that the Iranian regime’s domestic crises, facing a powder keg society seeking to bring an end to the clerics’ rule, are of the utmost priority for those on the throne in Tehran. As a result, regional and global isolation should evolve into the international community as a whole standing shoulder to shoulder with the Iranian people’s struggle for freedom and democracy. Following the United States’ decision to exit the Iran nuclear deal, we are witnessing the beginning of a significant series of measures against Tehran. Cascading sanctions are in the making and continuing economic relations with Iran would be tantamount to shooting yourself in the foot. 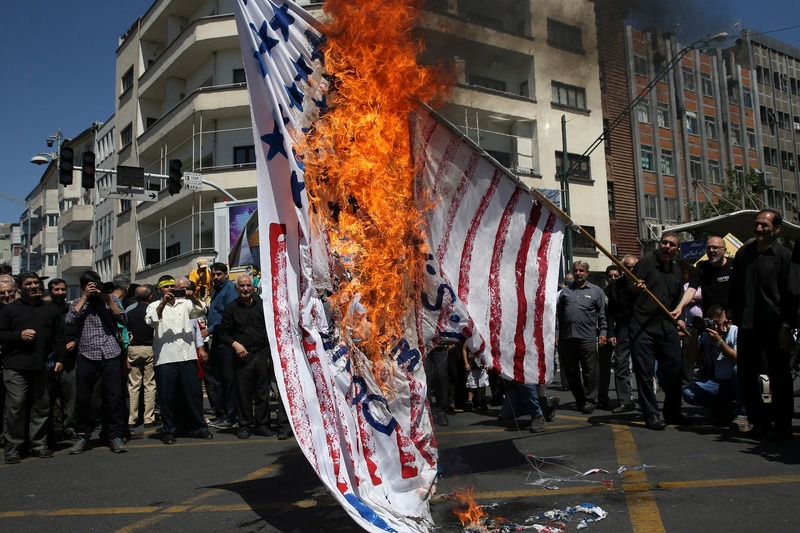 Iran’s economy is on the ropes and Washington knows quite well how to make the ruling clerics understand how their four decades of belligerence will no longer go tolerated. Interesting is how the new US sanctions are targeting the regime, its entities and senior officials, going the Iran apologists camp arguing such measures will hurt the Iranian people. And these sanctions against Iran’s regime will continue, especially since Tehran believes any back-stepping will lead to devastating defeats in the very near future for its entire apparatus. The US Treasury Department explains how all pre-JCPOA sanctions will return in two 90 and 180 day phases, while no new contracts will be permitted with Iran. The regime’s Revolutionary Guards (IRGC) and its extraterritorial unit, the Quds Force, are in the center of Washington’s crosshairs. The very significant nature of these sanctions lies in the fact that Washington’s latest endeavor targets Iran’s financial sources, being the root of its domestic crackdown and foreign meddling. Trump has tweeted how Iran’s military budget has interestingly skyrocketed by 40 percent following the JCPOA, while the accord claimed to seek peace and security across the region. 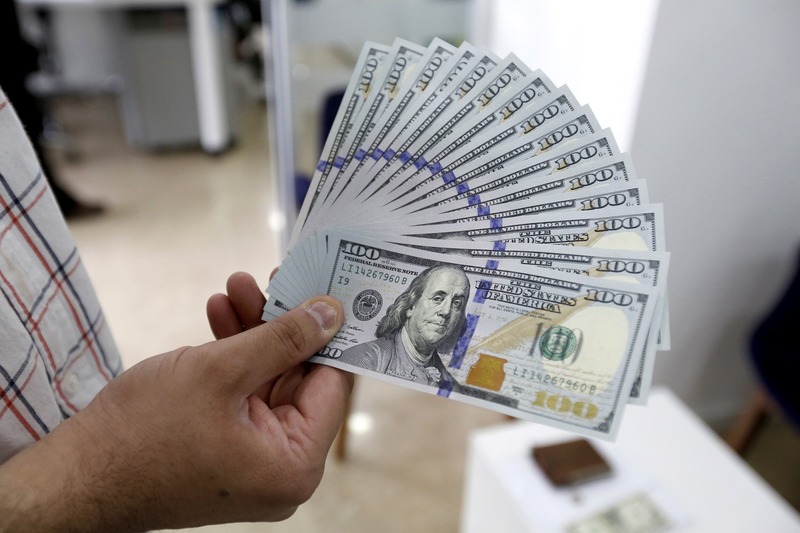 There has been cooperation with the US to sanction an Iran-linked currency exchange network involved in transferring millions of dollars for the IRGC Quds Force. Such entities, linked directly or indirectly to the IRGC, result in the utmost concerns for Washington as they facilitate the Iranian regime’s measures causing havoc across the Middle East. The US is now also calling on Qatar to end its support for Iran-associated militia groups. The fact that Middle East countries are supporting Washington’s sanctions against Iran is quite imperative to counter Tehran’s measures to establish and take advantage of financial institutions for its malign activities across the region. The Green Continent is not happy about US President Donald Trump’s decision to exit the Iran accord, formally known as the Joint Comprehensive Plan of Action. Yet it doesn’t need rocket science to understand Europe would never make the strategic mistake of standing alongside the Iranian regime in the face of crippling US sanctions. – Italy’s Eni energy company announced it has no plans for new investments in Iran and from 2019 onward the firm will begin purchasing oil from other countries. – Back in 2007, European Union/United States relations rendered $1.045 trillion in trade, while the EU’s trade with Iran reached a maximum of $15 billion. It’s not hard to do the math. Ahmad Khatami, this week’s Friday prayer imam in Tehran, made it clear how the Iranian regime has no hope in Europe. “To say America no, the European Union yes goes against edification. We have to understand that the European Union has a bad track record on promises. They are no better than the US Plans were made for the EU to invest in Iran. Did they? They also cancelled a signed contract to sell us airplanes. The JCPOA didn’t save the country. In fact, sanctions upon sanctions are now imposed on us,” he said. It is worth noting that Ahmad Khatami has very close relations to Iranian Supreme Leader Ali Khamenei. Furthermore, the Tehran Friday prayer tribune has become a stage where Khamenei sends his representative to express his views about weekly developments. As a result, knowing Khamenei has the last word on all state matters, recent events are depicting a very dangerous slope for the Iranian regime’s future. Knowing this enormous amount of international pressure cannot go unanswered, Iran first responded by launching around 20 rockets from IRGC-associated bases in Syria into the Golan Heights. This sparked a massive retaliation by the Israelis against a variety of IRGC targets throughout Syria, to which Tehran has remained silent on. Tehran is now threatening to relaunch its nuclear fuel enrichment cycle and escalate military confrontation, all claims worth following to understand Iran’s future options in these troubling times. 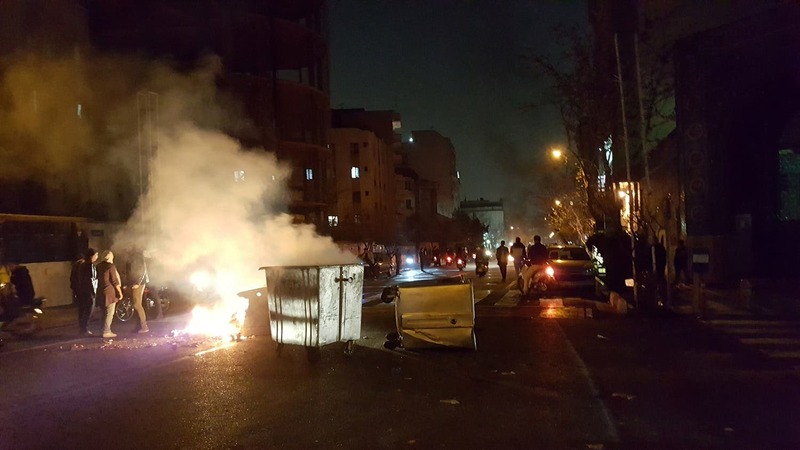 What goes less discussed are the Iranian regime’s domestic troubles. Protests by people from all walks of life continue to increase and the country’s currency, the rial, is nosediving. On Saturday, the air travel currency cap was decreased from €10,000 to €5,000, and €2,000 for ground/sea travel. All said and done, we will see in the coming weeks if Tehran exits the JCPOA and be bold enough to restart high level uranium enrichment. 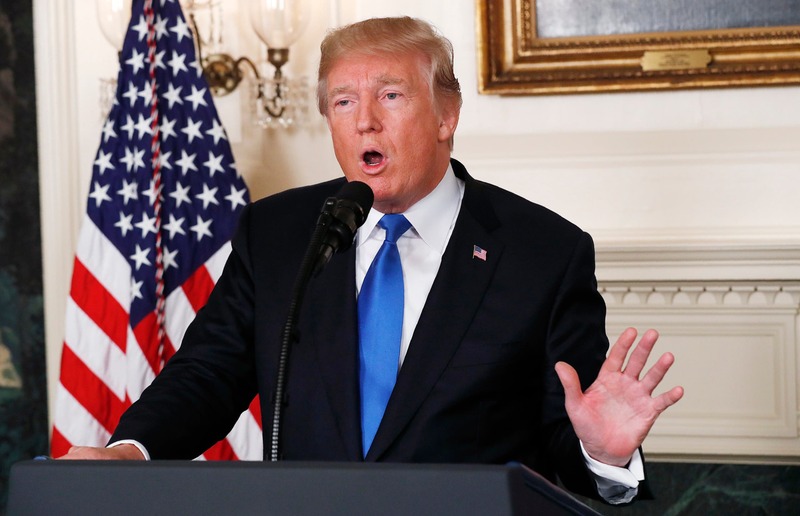 Trump has warned such steps by Iran would lead to “very severe consequences,” and history shows between bad and worse the Iranian regime will ultimately choose the bad option. Options before Tehran trace a very gloomy future. This will play into the Iranian people’s interests in their struggle against the clerical regime’s four decades of oppression and devastation. Iran took advantage of the highly flawed appeasement policy by staging military attacks seeking physically elimination, and also demonizing its opposition, being the National Council of Resistance of Iran (NCRI) and specifically the People’s Mojahedin Organization of Iran (PMOI/MEK), the main member of this political coalition that is considered the alternative to the Iranian regime.